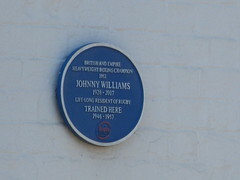 This article is about a British professional boxer, for persons with the same or similar name, see John Williams (disambiguation) Johnny Williams (25 December 1926 in Barmouth – 6 February 2007) was a British former professional boxer in the 1940s and 1950s and was at one time both the British and Empire heavyweight champion. Williams turned professional in 1946 and was known for his scientific approach in the ring, with one of his greatest fights being a bout with Jack Gardner on 17 July 1950 in Leicester. It was a Commonwealth title eliminator fight and he lost on points, and according to the BBC it was rated as one of the most grueling bouts ever staged in Britain and left both boxers requiring a night in hospital. Williams had a rematch with Gardner and won the 15 round fight, claiming both the British and Empire titles in 1952. However, Gardner made a comeback in 1955 and knocked out Williams after five rounds for the title. Williams retired in 1960 with 60 wins, 38 by knockout, 11 losses and 4 draws, and began a career in farming. He died on 6 February 2007 survived by his wife and daughter.